Aloe Vera Gel from Fruit of the Earth is made of 100% Aloe. It is made with the most concentrated amount of freash Aloe Vera leaves on the market. This cooling gel forms a protective barrier that helps retain moisture and promote healing. 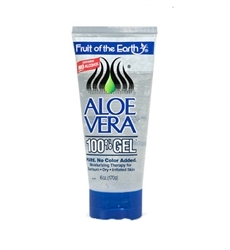 Aloe Vera Gel is a non-oily moisturizing skin therapy for dry and irritated skin.